Set in the dazzling Dubai Marina, the luxurious Marina View Hotel Apartments is barely 3 km from Jumeirah’s public beach. 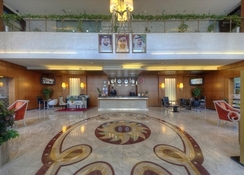 Located on Sheikh Zayed Road and in proximity to numerous shopping malls, restaurants, bars and clubs, this hotel is known for its opulent facilities and warm hospitality. Its spacious, modern apartments provide high-quality amenities such as well-equipped kitchen, dining area and lounge areas, which offer you a world-class hotel experience. If you are looking for an amazing holiday experience amid authentic Middle Eastern hospitality, Marina View Hotel Apartments will leave you delighted with its large pools, fitness centre, restaurant, bar, spa and beauty salon. Such a rare package makes it a top favourite of tourists of all type – be it couples, families, honeymooners and business and solo travellers when they visit Dubai. The hotel is a 5-minute drive from Jumeirah’s public beach and stands tall between Dubai Marina Mall and Dubai Marina Metro Station. Popular tourist attractions like Palm Jumeirah, Burj Al Arab, Souk Madinat Jumeirah, Emirates Golf Club, Jebel Ali Free Zone, Emirates Mall and Emirates Golf Club are all within a short cab ride. The nearest airport, Al Maktoum, is 21 km away. Marina View Hotel has comfortable, well-appointed apartments available both for smoking and non-smoking guests. These modern, luxury apartments are painted in soft colours and come with a well-equipped kitchen, dining space and lounge area within each apartment, and selected amenities. The accommodation options are categorised into Studio Apartments, One-Bedroom Apartments and Two-Bedroom Apartments. All apartments are furnished with en-suite bathroom, complimentary toiletries, hairdryer, digital safe box, iron and board, washing machine, dryer, fridge, cutlery, crockery, cooking utensils, kettle, hot plate, microwave, toaster and coffee/tea maker, TV with satellite connection, Wi-Fi connection and daily housekeeping. The fully functional kitchens in Marina View Hotel Apartments Dubai ensures guests can prepare food to their liking. But if cooking isn’t on your plans, dine at the hotel’s Mosaic restaurant that serves breakfast, lunch and dinner of Arabian, Mediterranean, European dishes and seafood both in buffet and a la carte styles. The restaurant can accommodate 70 guests indoors and 150 outdoors. Drinks are served on the terrace. The hotel has large, temperature-controlled outdoor swimming pool for both adults and kids equipped with sun loungers and parasols. A well-equipped staffed gym stocked with state-of-the-art machines and offering customised fitness programmes is available. There are facilities for volleyball, beach ball, aqua gymnasium at the hotel and boating, jet-skiing, kayaking, sailing, sauna, snorkelling, surfing and water-skiing at the beach. 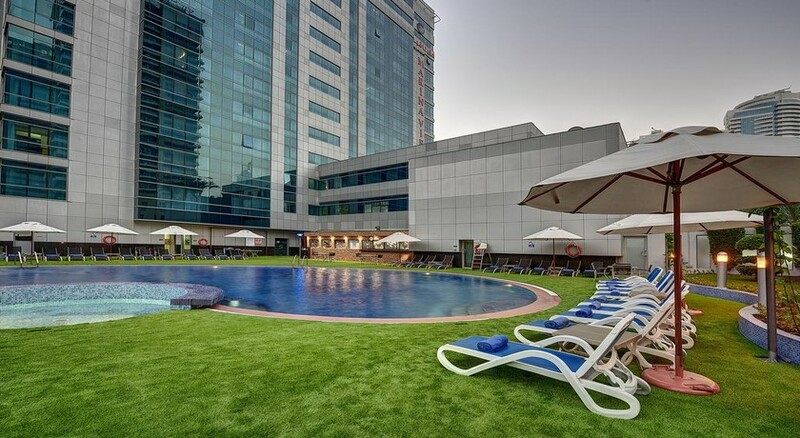 The hotel organises various events, friendly games/matches and animated shows for guests. You can also rejuvenate yourself at the steam room and sauna. The hotel also has a souvenir shop and gadget store for indulging in retail therapy. The Tourism Dirham is a minimal charge that is applied to hotel guests, staying in any accommodation type, including hotels, hotel apartments, guest houses and holiday homes. Please note from 1st of May 2018 complimentary bottles of water, coffee/tea amenities in the room will be provided upon arrival only instead of a daily supply. Please note that Guest will receive 2 bottles of water and 1 coffee/tea amenities per person upon check in. Additional water/coffee/tea requirements will be available in our Mosaic Restaurant or 24h Room Service at extra charge. We would like to inform you that hotel Swimming Pool will be closed for maintenance from 02 of June till 9 of June 2018. During this time they are providing alternative Swimming Pool nearby hotel with shuttle service. Fantastic location. Breakfast was very reasonable.